Last time we did kimchi, 2 years ago (every day, week, month, and quarter—it’s been a quarter of a year since I wrote anything here—just picks up more and more speed, snowball style), it was a quasi-traditional, vegetarian, napa cabbage one, and I live-tweeted the whole process. This one is similar, but a little quicker and therefore arguably a little easier. Scallions are one of the easier-to-get-your-hands-on spring vegetables, available in abundance, so I thought it’d be a good thing to highlight here. Farmer’s market scallions—you can pick up some purple ones!—are thinner and have longer, bushier tops than the grocery store varieties do. They’re also grittier and need a more rigorous cleaning, in several changes of water. This recipe comes from the latest issue of my digital magazine, Feast by Lukas. In this issue, called “Building Blocks,” kimchi functions as one of those little accessories that makes for easy, tasty, component-style meals. I’ll add kimchi to lots of things—sandwiches, rice and noodle bowls, savory pancakes, in soup, as a topping for crostini, and right out of the jar with a fork. 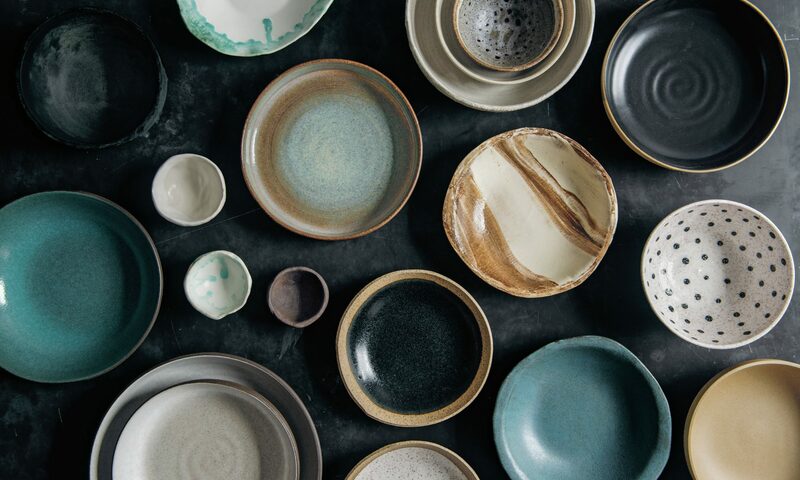 Other dishes in this issue include a “slaw starter,” primers on the #putaneggonit egg, some excellent vinaigrettes, a recipe for “nut muffins” (saying that out loud still makes me chuckle), and more. Also, I’m proud to share that photographer Cara Howe collaborated with me on this issue, and her gorgeous photos—that’s hers up top, and on the cover of the issue—are such a huge improvement to the project I still can’t even believe it. You can download the Feast by Lukas app in the iTunes store, and within that you can subscribe or purchase individual issues. 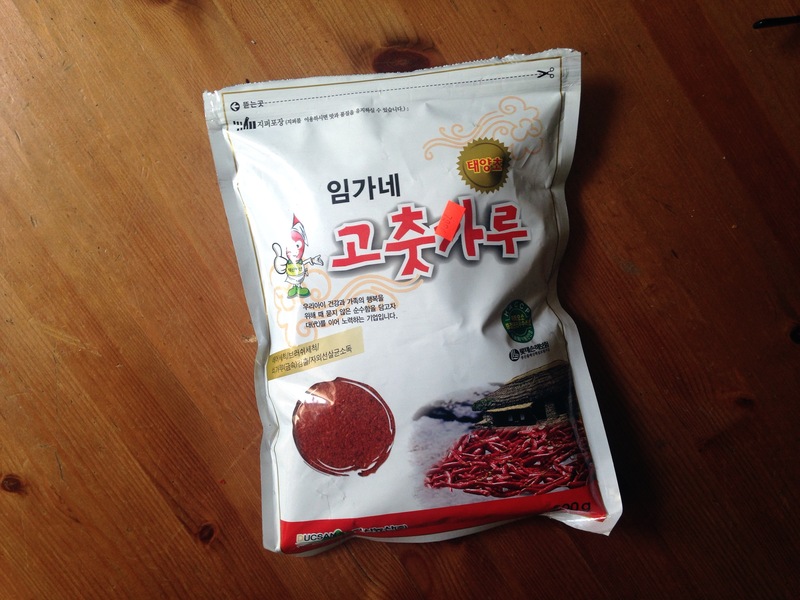 These are the Korean red pepper flakes that I use. I get them at HMart on 32nd Street in Manhattan (I don’t see this particular brand in their online store, but they have a few others to choose from). Korean red pepper flakes aren’t super spicy—they don’t contain the seeds of the peppers—and smell quite fragrant, smoky, and sweet when you open up a bag, a bit like roasted red peppers. If you don’t want to order them online, can’t find them where you live, or just aren’t inclined to bother, I’ve made kimchi from crushed red pepper, to which I usually add a pinch of smoked paprika to give some complexity to the flavor. It’s a decent substitute, but do note: crushed red pepper is much spicier than Korean red pepper flakes, and you’ll use much less of it than you would the Korean pepper flakes (see the instructions below). Also, the kimchi won’t be as richly red, and the flavor won’t be quite the same, but it’s still a totally worthwhile endeavor. 1. Whisk together the flour and water in a small saucepan. Place over medium heat and cook, stirring constantly, until the consistency of glue, which will take about 2 minutes. Watch carefully, as this happens in an instant. Cool completely. 2. Trim the ends and any discolored parts from the scallions. Cut into 1- to 2-inch lengths. Toss with the 2 teaspoons kosher salt in a large bowl and let stand for 20 minutes. Discard any liquid that accumulates in the bottom of the bowl. 3. 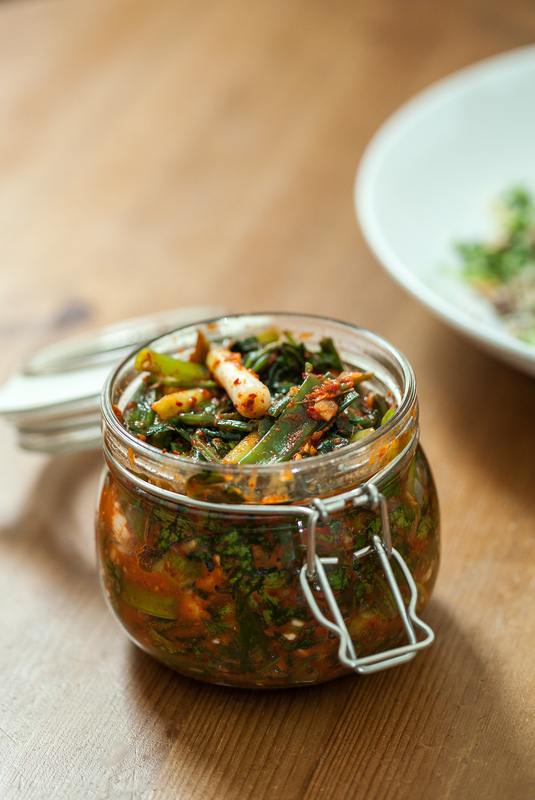 Cut or tear the watercress into bite-sized pieces and add, along with the garlic, ginger, 2 tablespoons pepper flakes, sugar, and fancy salt, to the scallions, stirring with gloved hands (kimchi is pungent; it lingers on the skin) until combined. Add about half of the flour paste. Mix well, and then add additional flour paste as needed so that the mixture is well moistened. Taste. Add additional pepper, and maybe a few pinches of salt or sugar, as needed. 4. Pack into a pint glass jar or a couple of smaller jars, allowing 3/4-inch headspace. Wipe the rim(s) clean and seal tightly. Leave at room temperature for 2 days, flipping it every 12 hours or so to distribute the liquids, and opening the jar(s) every day or two so to release the gas pressure inside. Transfer to the refrigerator, where the kimchi will keep for a month. It’s safe to eat at any point, but best after it’s fermented for at least 5 days.